It was lovely to hear some of my old musician friends performing at the Budleigh Salterton Jazz Festival recently. Mark Nightingale (Trombone), Martin Shaw (Trumpet) and Alan Barns (Saxophone) made up the front line supported by the Craig Milverton Trio and special guest singer Tina May, what a tremendous sound they made together. And a special thank you to Tony Dealler (organiser of the festival) who managed to find me a ticket at the last minute from this sell out concert. To hear so many great jazz musicians on stage together is truly amazing, everything they played seemed effortless. Mark Nightingale, Martin Shaw and I go back a long way, we all started playing together many years ago in NYJO (National Jazz Youth Orchestra) when we were just starting out in the music business. 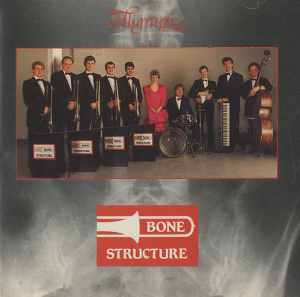 As a spin off of NYJO Mark Nightingale formed his own band called Bone Structure, which consisted of five trombones and a rhythm section together with a singer. I was delighted to be asked by Mark to join the band. Bone Structure performed regular gigs all over London and became a well respected and high profile band particularly amongst trombone players. We recorded an album in 1989 on Humphrey Littleton’s record label (Calligraph Records) joined by Lorraine Craig on vocals. It was a great play for all the band members as we had some fantastic arrangements (many of theses arrangements written by Mark himself). This entry was posted in Articles, news and tagged article1, Budleigh on April 20, 2015 by mike.